There are many styles of sash window but all have one common denominator, they all have an operation that requires the weight of the window to be supported to allow ease of opening. The earliest examples of the sliding sash window had an operation whereby the window would slide horizontally without need for the window to be supported but since around the 18th century most sash windows were designed to slide vertically. Traditional “hung” sash windows reply on a weight system with each window connected to sash cords that are strung over a pulley wheel and attached to a cast iron weight inside the box frame. This cast iron weight is approximately half the weight of the sliding sash, with one on each side they equal the same as the sash window. With the weight of the window balanced by the sash weights the window will lift open and stay open in whatever position the user may choose. Modern sash windows can sometimes utilise a system referred to as the spiral balance mechanism. The spiral balance is effectively a metal rod that runs up the centre of a strong spring connected at one end. The spring and rod assembly is shrouded within a plastic tube to keep it straight and also for cosmetic reasons. The spring is connected to the box frame sash window run by a screw and the spring is tensioned by turning the metal rod against the spring thus creating tension. Much like some cheap weight lifting and fitness machines the spring mimics the action of gravity by the pulling force of the tensioned spring. Both sash window balance systems work well but neither a failsafe and will certainly require repair and maintenance over the years. The most reliable system is, as most professional sash window experts will tell you, the traditional weighted sash window system. The most common issue with a box sash window is broken sash cords but other problems can occur especially if you replace glass. Older box sash windows will have been weighted for 3mm glass, modern glass is 4mm for safety reasons. 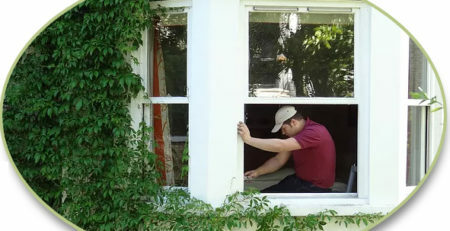 This means that if you ever need to re-glaze an old sash window the glazier will no doubt use 4mm glass and you will then unwittingly have increased the windows weight by around 25% The window will then require the sash balance weights to be adjusted to ensure the window still functions as intended. The same would go for spiral balanced windows although the remedy would be simpler as you would only need to increase the tension on the spring to account for the twenty five percent increase in the sash windows weight. If your sash windows seem to drop closed when you open them or if the top sash slide open on its own then it is likely that you will need either sash cord repairs and or sash window make weights added to the existing sash weights. All the issues discussed in this article and more can all resolved by visiting our home page or by calling us on 020 7118 9191. We take care of all types of sash window repair work including sash cord replacement, spiral balance replacement and window rebalancing. Sash Windows Guide for Home building and Renovating with Mortice and Green.